We don’t have this dish very often; there must be 1000 calories in one serving of this meal. But I felt compelled to serve this up in honor of the anniversary of my Mom’s birthday. If she were still alive, she’d be 87 today! (Actually she’s a leap year baby so her true birthday date is February 29th). Pan-fried liver was a regular dinner offering when I was growing up. I always looked forward to the buttery-browned onions and crispy bacon. The liver? Ah. . . not so much. But back in the day my brother and I didn’t dare say anything negative about the food that was put in front of us. I was too worried that if I spoke up I would hurt my Mom’s feelings and, worse yet, incur the anger of my step-father. So I tolerated the liver by drowning it in catsup. Catsup was definitely my friend! Poor, sorry, liver and onions. They certainly get a bad rap. But when I consider the techniques to prepare this dish, I realize that it offers quite the nice balance of flavors. Browning the onions for several minutes provides a sweetness. Soaking the liver in milk calms down the bitterness. The bacon adds that salty, smoky kick. And frying it all in butter makes everything better, as they say! So kudos to my Mom for her kitchen savvy. 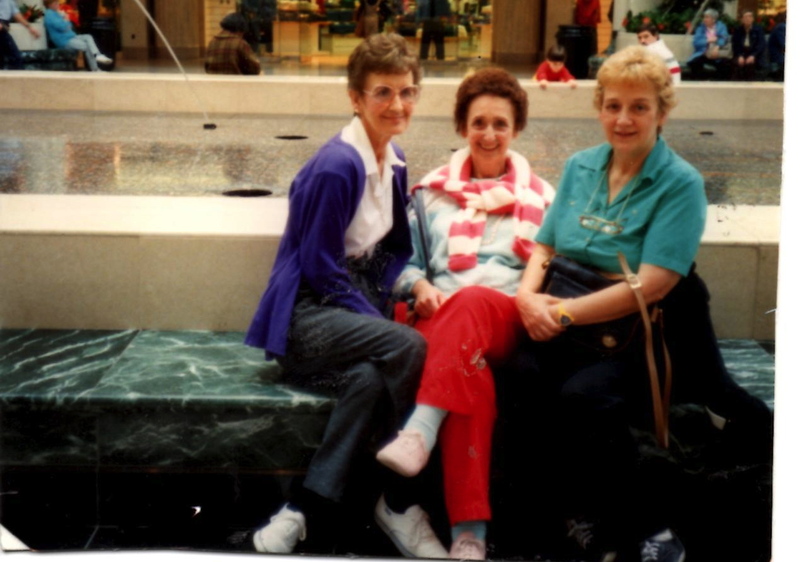 Mom was not only a good cook, but a fine seamstress and knitter. She supported her kids by working as a waitress for many years. Her customers spoke quite highly of her and became her friends. More importantly, she was a loving sister and a caring Mom. I’m sure she didn’t hear that from her family as much as she deserved. Tension was thick at our house and conflict was the norm. Unfortunately, life in general at home when I was growing up was a little more bitter than it was sweet. Today I’m choosing to feast on the sweet. Start with bacon. You can never go wrong with bacon! Pack in as many strips of bacon as you can in your skillet. I used my ceramic cast iron. Fry bacon until close to the desired crispness. Once you’re done frying the bacon, remove from pan and pour off most of the bacon grease. Discard the extra grease. Melt a half of a stick of butter in the pan. Toss in the sliced onion. Cook the onion on medium heat until golden brown. Towards the end, add in the bacon and cook together for a minute. 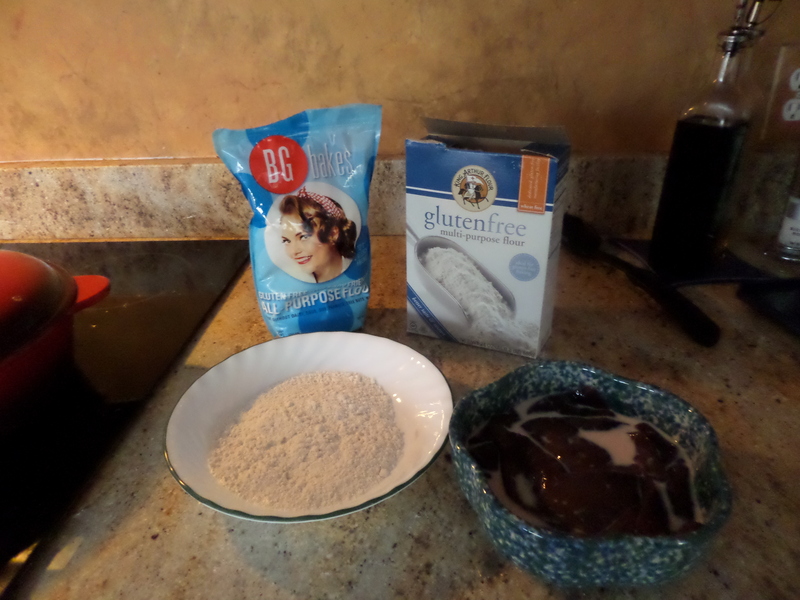 Since my husband is gluten free, I use either King Arthur or BG Bakes GF flour for the dredging. Salt and pepper the flour if desired. Jim can’t have pepper, so I don’t season it. Not sure it needs salt since you’re cooking the liver with bacon. Dredge each piece of liver in the flour. Melt another half stick of butter in the pan and then add the liver. Looks rather unappetizing at this point! Fry the liver for a few minutes until brown. Flip and fry a few more minutes. My cast iron fries food pretty fast, so I use a medium to medium low heat. Minutes will vary depending on your skillet. We like our liver just barely pink on the inside. 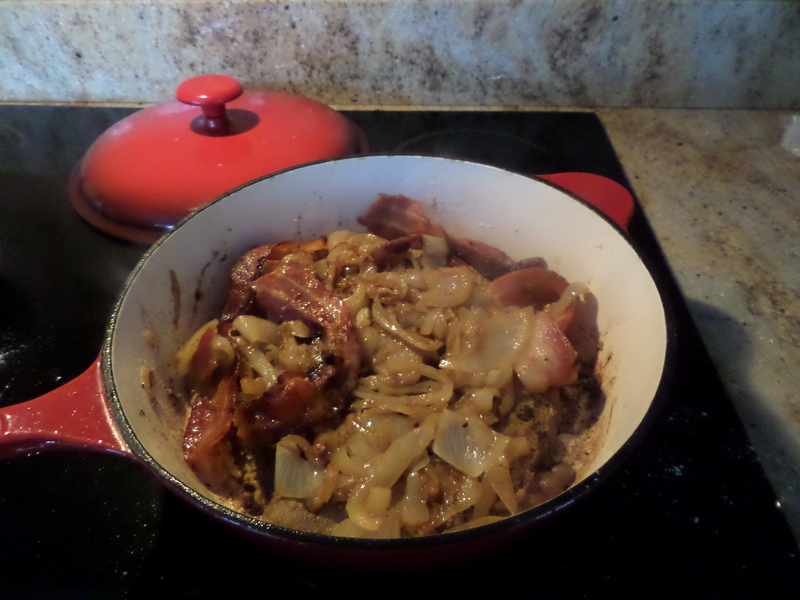 Once the liver is nicely brown on each side, add the onions and bacon back into the pan. Cook liver, onions, and bacon for about 30 seconds. Ta-da! 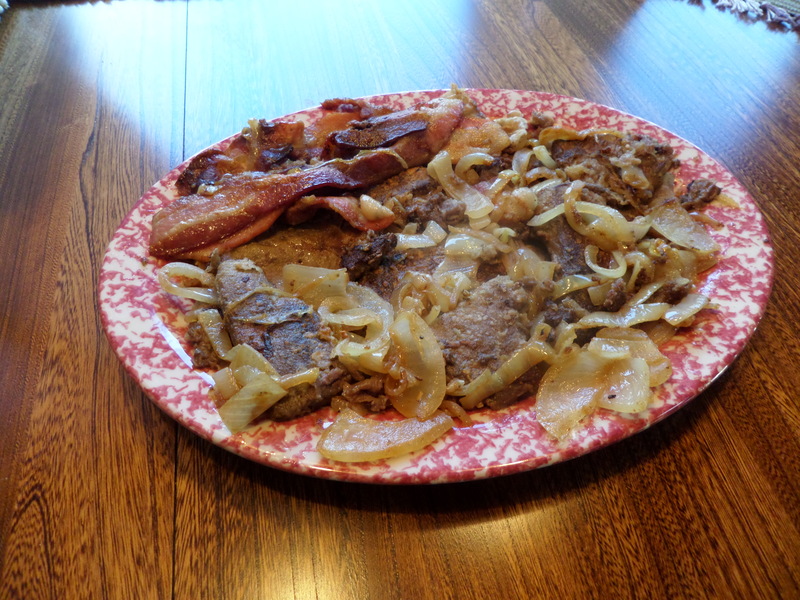 My Mom’s liver and onions with bacon. 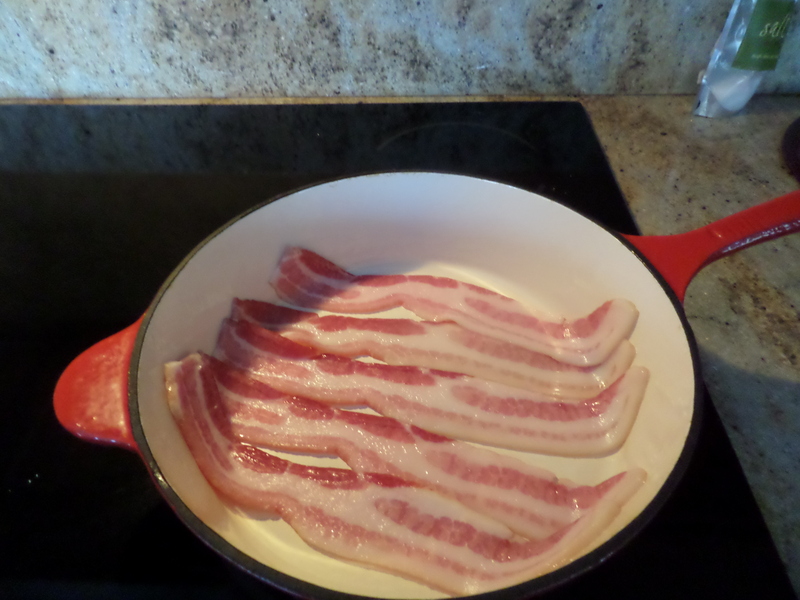 Place bacon in large skillet. Fry until it is close to the desired crispness. Drain skillet of most of the bacon grease. Remove bacon and set aside. Melt a half stick of butter in pan. Add sliced onions. Cook for several minutes until golden (slightly carmelized). While onions are cooking, place flour in a shallow bowl. Place liver in a bowl with one cup of milk. If desired, do this earlier which will help the liver become even less bitter. 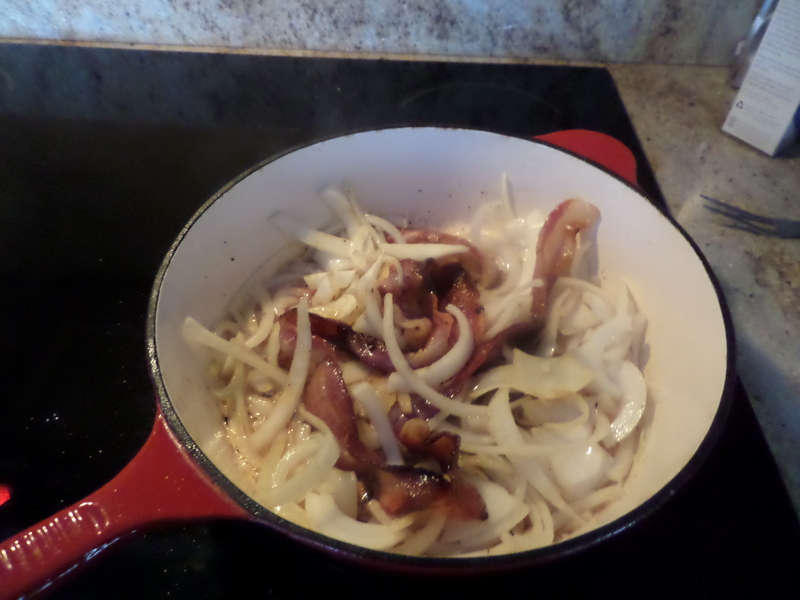 Throw the bacon back in the pan and cook with onions for a minute or two. Remove onions and bacon. Set aside. 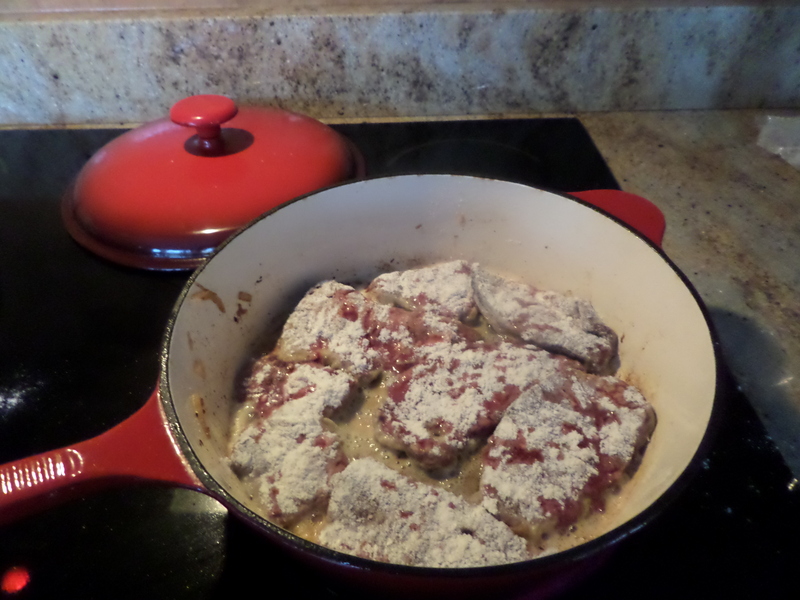 Dredge each piece of liver in the flour. Place in pan. Cook for 2-3 minutes or so on each side. Turn liver over when bottom side is nicely browned. Make sure you brown both sides well. My cast iron cooks quickly. Your pan may be slower. Check the liver on the inside to see if it is cooked through. Jim and I like it barely pink. Add the onions and bacon back into the pan. Cook for about 30 seconds. Serve on a pretty platter and enjoy! Although ,Donna, I don’t use all the extra butter and bacon grease. And I like mine with mashed potatoes (that’s were the extra butter goes). And definitely NO ketchup! My mouth was watering as I read. Now I’ll have to go and buy liver yum. Your mom was wonderful! I can’t say the same for anyone’s liver!!!! Yes, liver and onions have not been favorable amongst my readers. Interestingly, 44 people shared this link on Facebook. That’s the most shares I’ve ever had. Curious . . .